It is not always clear how the people who will be named on the British Normandy Memorial lost their lives. This is the case with 20 year old Able Seaman John Edward Wright from Middlesex. Able Seaman Wright was as a sailor on board HMS Haslemere. 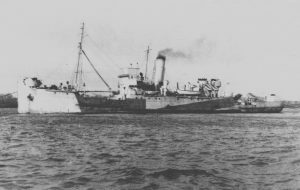 HMS Haslemere had been requisitioned from her peacetime role carrying passengers, and was a control and receiving ship for one of the two Mulberry harbours during the Battle of Normandy. The Mulberry harbour was an artificial harbour which was towed across the Channel to Normandy in sections by the Allies, and assembled off the French coast. HMS Haslemere’s role was to control the assembly of the Mulberry ‘B’ harbour. This was installed at Arromanches, off Gold Beach, where the majority of British forces landed on D-Day. 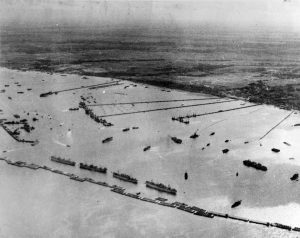 The Mulberry harbour enabled the Allies to quickly unload supplies and vehicles to maintain the momentum of the invasion, and ultimately to secure a foothold in France. The British Normandy memorial will be built overlooking Gold Beach and the rusting remains of the Mulberry harbour, which still survives to this day after 75 years. Able Seaman Wright died on the 10 June 1944. His body was never found. 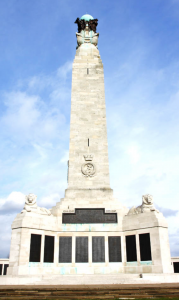 He is commemorated on the Chatham Naval Memorial for Royal Navy personnel lost or buried at sea. Courtesy of the Commonwealth War Graves Commission. Soon Able Seaman Wright’s name will also be added to the British Normandy Memorial.